Summary: From the author of the New York Times bestseller and beloved book club favorite The Kitchen House, a novel of family and long-buried secrets along the treacherous Underground Railroad. It's hard for me to believe that it's been six years since I've read THE KITCHEN HOUSE by Kathleen Grissom. I read it twice -- once on my own and once for my book club. My friends absolutely loved it, as did I; and I often wondered if Ms. Grissom would write about what happened to the characters after the last page of the novel. Well that question has now been answered in her new novel GLORY OVER EVERYTHING. 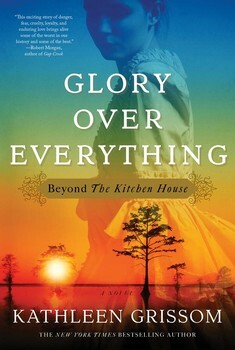 GLORY OVER EVERYTHING tells the story of someone you might remember if you read THE KITCHEN HOUSE, Jamie Pyke. Jamie was the son of a slave and a master, but he didn't know this for much of his childhood. When something major happened in THE KITCHEN HOUSE (I won't spoil it! ), Jamie was forced to run away from Tall Oakes, the Virginia plantation he considered home, and start a new life in Philadelphia passing as a white man. Jamie is taken in and eventually adopted by a kind couple. Jamie makes a name for himself as a silversmith and becomes quite wealthy. He even falls in love with a high society woman named Caroline... who just happens to be married. When Caroline ends up pregnant with Jamie's baby, he is forced to reveal his secret identity. However, before he can figure things out with Caroline, his young servant Pan goes missing. Pan's father suspects he's has been kidnapped and taken to the South to be sold into slavery! Jamie promises to help find Pan despite his fears of coming into contact with some dangerous men from his past. In fact, Jamie thinks it's very possible that a slave hunter is still looking for him. Things go from bad to worse with Jamie when Caroline's father discovers Jamie's secret, and Jamie is forced to flee Philadelphia unless he wants his history revealed. Jamie is left with almost nothing as he heads down to North Carolina to find Pan. By sheer coincidence, Pan is living with a former Tall Oakes slave Sukey (remember her?) Fortunately, Sukey is determined to get Pan to the Underground Railroad. Jamie, Sukey, and Pan join together to escape the terrible conditions in the South, and they find themselves in a dangerous situation as they try to navigate the Underground Railroad. Can the three of them survive long enough to find safety in the North? I absolutely adored GLORY OVER EVERYTHING! Once again, Ms. Grissom has proven herself as a wonderful storyteller. I loved meeting many of her characters again, and she definitely made their lives interesting. I do want to let readers know that GLORY OVER EVERYTHING definitely works as a stand-alone novel. The only question is why wouldn't you want to read THE KITCHEN HOUSE first? GLORY OVER EVERYTHING is such a special novel. Everything about it worked for me. I enjoyed how the author tackled some very real issues, and it was interesting to see Jamie live as a white man in Philadelphia and then have his entire world come crashing down. I enjoyed his story in Philadelphia quite a bit, but I also really appreciated the novel when Jamie began his quest to find Pan. The book was both intriguing, and at the same time, suspenseful! I have to say that Ms. Grissom did a remarkable job of bringing this time period to life. I love how she described the Underground Railroad and especially the Great Dismal Swamp; and her descriptions of the slave's medical building were also real to me. I was especially impressed with how she described the fear in the characters' lives -- Jamie was always looking over his shoulder for the slave hunter and Pan was terrified when he was stolen and transported to the South. Another aspect of this novel that I truly appreciated was how the author told the story. She used a variety of characters to narrate the story. Personally, I was impressed with how she pulled off their different viewpoints and made each of them unique. I also loved getting their different viewpoints on the events of the story. Needless to say, GLORY OVER EVERYTHING would make a wonderful book club selection. There is a reading guide with fifteen thought-provoking questions as well as some ideas to enhance your meeting. Some of the themes you might want to explore include secrets, lies, identity, race, second chances, obligations, social classes, self-preservation, prejudice, and love. GLORY OVER EVERYTHING is a wonderful book. Highly recommended to fans of historical fiction and especially readers who loved THE KITCHEN HOUSE. It sounds like Grissom does a fabulous job with that time period! I haven't read In the Kitchen House. I'll have to give it a try. My book club may like this recommendation! Thanks. I just finished reading this book. What a powerfully told tale with interesting, varied, and engaging characters. I could not put it down! A great selection for bookclubs. Your review was spot-on! I'm glad to hear this works as a stand-alone. Our book club read The Kitchen House a few years ago and I remember liking it very much. But I don't remember all the details. Glad to hear they aren't important to this story!